Lovely Things has moved here, please come and check it out. Thank you! I started thinking about decorating for the holidays with planning this year's advent calendar. I decided to stick with things I have around the house, my recent thrift and flea finds and my usual color palette of natural, black, white and silver with touches of green. The first thing I did was paint a 4' x 4' piece of 1/4" plywood with chalkboard paint. Then I emptied my candy jars, washed and filled them with holiday treats. 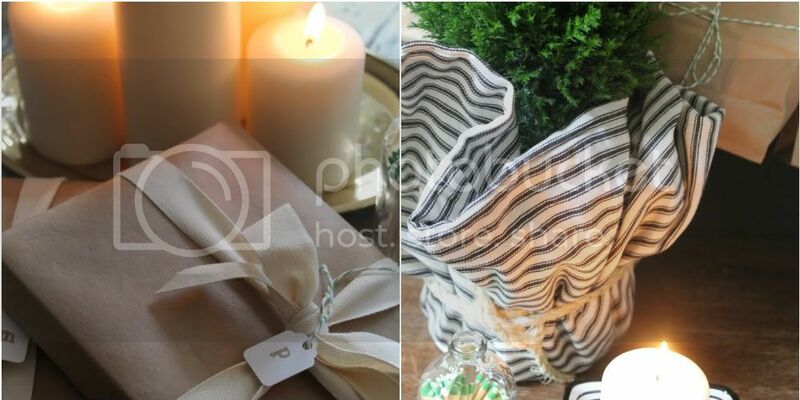 I used my black and white ticking stripe pillows from Juxtaposition to wrap around little trees I found at a local nursery for $5 each. The entire project including the supplies for the chalkboard were less than $50 and it's a whole new look from last year. (You can see last year's advent calendar here). 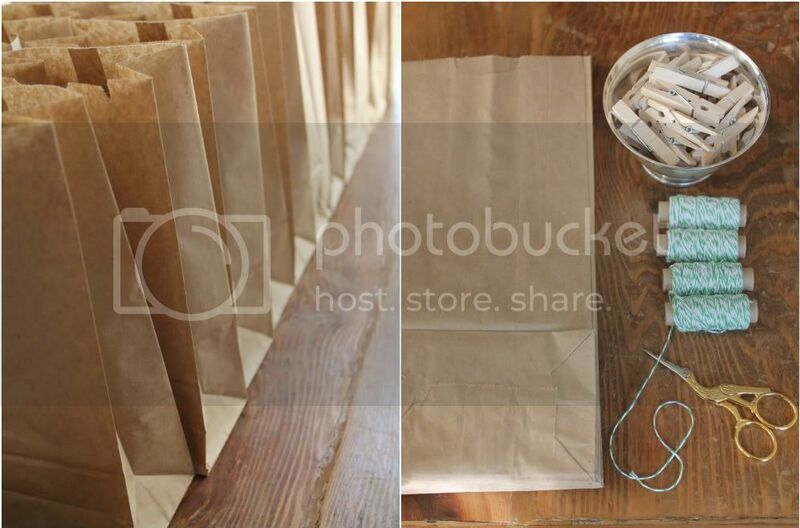 I used lunch bags and twine and filled 24 bags with little presents for Madeline and Patrick...12 each. I can never have too much candle light...especially when the days are shorter. I found all my old jars that were large enough to hold a votive, wrapped twine around the top to give it a little something...my favorite jars are the ones that have writing in the glass like the Bonne Maman jam jar and the De Cecco one. The candy jars are filled with things from Trader Joe's. I wish I had not sampled the waffle cookies with chocolate and peppermint...I can't stop thinking about them. I searched my cabinets for anything silver, gold, black and white and a little green. The little match holder is also from Juxtaposition and it is a reclaimed apothecary bottle that has been scored on the bottom so that you can strike a match. So are you decking the halls? Are you using old or new or a combination of both? Enjoy the season! I just noticed that this post is featured here today: blog.holamama....Thank you! And at ABCDdesign today-- Thank you Amy! and here: Momjeanz. and The Corson Cottage. Thank you Paula at Two Ellie! You are so creative, Annie! I love the advent calendar with the bags and all of your glass jars. Everything is picture perfect! I haven't even started decorating since I've been sick all week. Hoping to drag things out tomorrow and get started! BEST ADVENT CALENDAR EVER!!!! How in the world did you come up with it? It is so creative and I would NEVER have thought this up!!! LOVE it. This is truly amazing...I love it! Like a cute little coffee shop! I actually thought at first the baggies were to be used to fill with the goodies you have on the table! I must exclaim I LOVE your style. annie you did this? omg, i thought the top photo was something from a magazine. you are so dang talented. i love it! the color combination is perfect. i have not done one thing for the holidays yet. i better get busy. I get paid to design and I don't think I do it half as well as you do. This whole post is amazing!! I love that you used things that you already had and managed to come up with all of that. By the way, you pay me such nice compliments but...umm I don't think you need any help in the design department!! What a gorgeous display Annie, love the brown paper bags idea! What a spectacular post!! That is by far the most beautiful advent calendar I have ever seen!! Just perfect in every way. I am sooo impressed. Keeping this handy for my next 'posts to ponder" to include yours...fabulous! Oh, how pretty! I do like your idea and perhaps next year will do something similar. I've posted about advent calendars today too and linked yours in it, for inspiration! Beautiful! Love the jars with candy (TJ's = death to my waistline) and the sweet porcelain angels! Annie this is absolutely enchanting. You have now inspired me to start decking the halls. All looks merry and bright! OMG I have a chalk wall and this is SUCH a cute IDEA!!! Lovely as usual. I love the color palette and all the treats look so yummy. Don't even look at the Trader Joe's chocolate mint cookies. EVIL! Absolutely beautiful! At first I thought your photo was taken from a magazine, it's that beautiful. You are extremely talented and you should be a stager or designer, if your not already. I have felt so overwhelmed this week that I haven't even taken out the Christmas decorations yet (well, I did get out one, the advent calendar, but that is it). Can you believe the weather today? It was 82 up here so I am assuming it was just as warm down there. Love days like that! Doesn't feel like Christmas though! You're like an on-line magazine, a blogazine. Everything looks beautiful and it's beautifully photographed. I think we should open a store. It's beautiful! My daughter is a teacher and I referred her to your blog, what a great ideas for her classroom! Thanks for sharing. This is beautiful! I'm dying to know what's in the bags-it's all so enticing! I wish I had kids to make an advent calendar for! Absolutely gorgeous!!! Love the Advent Calendar...so creative! 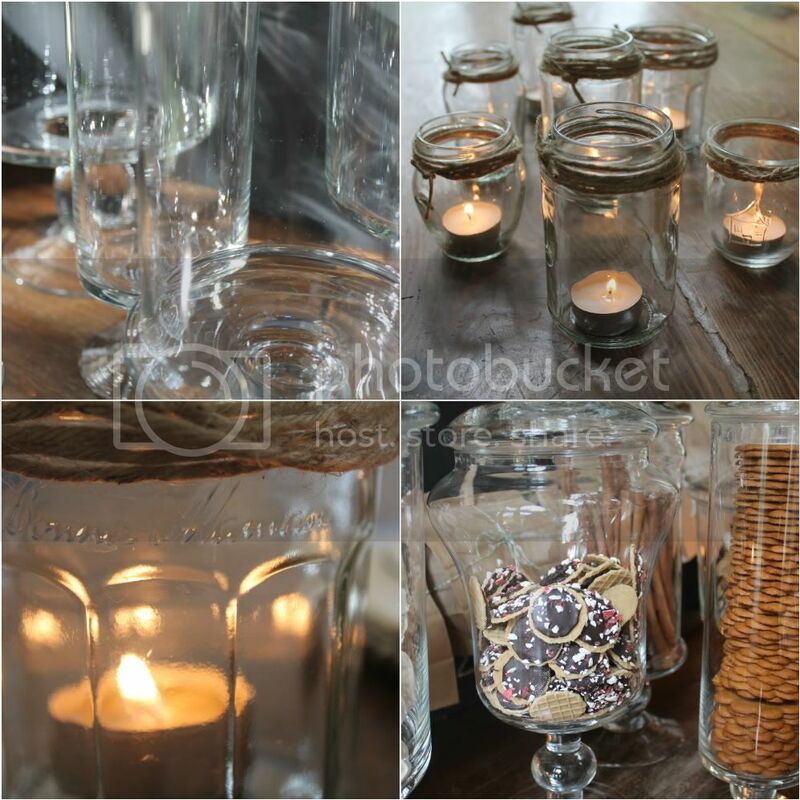 And all those jars twinkling with candles are beautiful! Wonderful ideas!! I am mixing it up. Isabella and I wrapped a lot of candles with red ribbon. Also using an assortment of linens. Andrea from the French Basketeer sent me 8 antique French napkin Rings! I love your blog:)Your advent is awesome, I'm making mine a mobile this year (I'll have pics up on my blog soon). Your advent calendar is ingenious and charming. You are such a great mom and decorator. I was happy to pull our stockings that I got for 75% off after Christmas last year at Rogers Gardens...the rest of the decor is old. But I have switched things around to keep it fresh. Your photography is incredible, Annie. oh my gosh, i love your calendar! such a great idea. next year...next year i'll be on top of it and do one. such a fun idea. Annie, I love your advent calendar - from the chalkboard wall with brown bags to the little vignettes of jars and goodies. So pretty and fun and that color scheme is lovely! I have been searching Etsy and kitchen stores for so long for glass canisters. I found your blog on Pinterest and there you have the exact thing I've been looking for. Please tell me you remember where you found them and they are still available? I'd be so appreciative. BTW, I'm an Ina Garten fan and love her kitchen, too. Hilary - I found my candy jars at Roger's Gardens in Newport Beach, CA. I'm not sure if they still have them, but I do see them around from time to time. I think I saw a few different ones at Micheal's the other day. Send me your email address...If i see them I'll pass the info along. Visions of your post will be dancing in my mind as I decorate 34th Street this week! It is so simple but just beautiful! Thanks for sharing and now you have my mind spinning about how else to use those lunch bags, thanks for the inspiration! Annie! This is so beautiful and simplicity at its best! I love it all. I want to move right in. Wow! What an fabulous vignette with such meaning and tradition. I love it! Way to go...how fun it must be to be little kiddies in your home! I saw this on pinterest yesterday and had no idea it was yours! How creative you are! I love every detail. Love the ticking and have used it for the holidays as well. Such a gorgeous vignette! I love all your choices, the paper, chalkboard, silver, candles, ticking and natural elements. Lovely! Love, love, LOVE it all! So simple and yet so elegant. I love how the candlelight bounces off all the glass and that advent calendar is such a creative idea! Beautiful! Thank you for you kind comment over at Tina's yesterday! I love this so rustic and homely ! Such a gorgeous idea, lovely images. Annie, I keep coming back to this! L-O-V-E your darling advent calendar! If I were a magazine editor I would surely come knocking at your door...this post is perfect in every way...so happy to have discovered your blog...adore your calm and beautiful style. 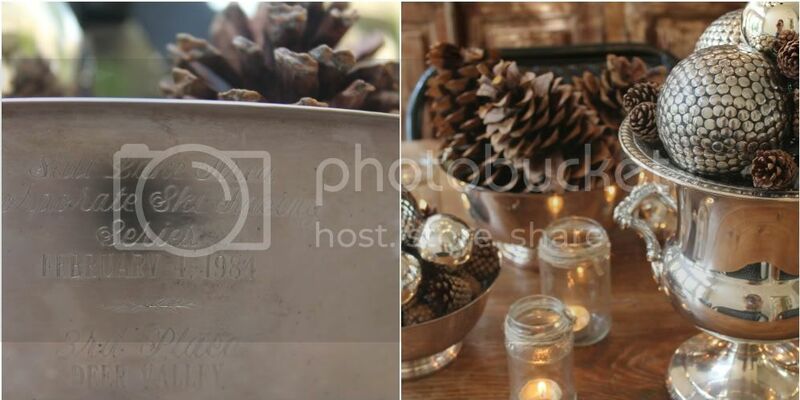 Annie I love this so much I'm planning to feature tonight at our Home for the Holidays party at The Corson Cottage. Thanks again for linking up last week! This is stunning...seriously. It has such a warmth. It feels so fresh, yet vintage too. Love your blog! This post was amazing. Your advent tradition and gorgeous jars have really inspired me! Beautiful! Hi there, I am stopping by from Mod Vintage Life! This is simply beautiful, it looks like it could have come out of a magazine. Annie, everything is so very pretty! The natural textures and colors are perfect. And you are so very smart to use pillow cases for the little trees. Perfect. I love this! Thanks for the photo. I also love the side board. Where did you get it? The side board is from RJ Imports in San Juan Capistrano, CA. I have done a few posts on RJ's. What kinds of items did you put in the bags for the kiddos? I'm always looking for new ideas. Hi Annie, I mentioned your great advent calendar here on my blog http://pecionate.blogspot.it/2012/12/aria-di-festa.html. This is such a beautiful post and project. Truly. It really stands out! This project is not only beautiful, it's so very clever! I'll be sharing on my blog today. Thank you for the inspiration! I just had to follow your blog, because this is such a great idea. I love all the little bags and the jars filled with goodies. I also checked out your kitchen and had to pin it, it looks so good (I hope you don't mind).